A new study of DNA suggests North America was originally populated by just a few dozen people who crossed a land bridge from Asia during the last Ice Age. 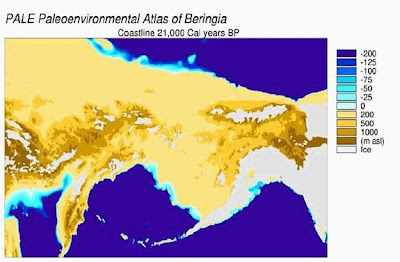 About 14,000 years ago, humans crossed the Bering land bridge from Siberia to North America, most experts agree. But just how many intrepid explorers were involved in spawning subsequent populations has not been known. Previous DNA analyses of the New World's founding looked at just one gene and assumed populations sizes have been constant over time. The new study looked at nine genomic regions to account for variations in single genes, and it assumed that sizes of founding populations change over time. The method favored actual genetic data over estimates used in previous calculations. Hey's calculations are also consistent with archeological evidence suggesting the initial settlement occurred around 12,000 to 14,000 years ago. "The beauty of the new methodology is that it uses actual DNA sequences collected from Asian peoples and Native Americans, an approach that can provide a detailed portrait of historical populations," Hey said. Hey focused on the genetics of Amerind-speaking populations, one of three major language groups in the New World representing the earliest migrants who extended deep into the Americas. The results are published in the June 2005 issue of the journal PLoS (Public Library of Science) Biology.